Kids swear a lot. And they have few qualms about using insulting and derogatory terms when addressing one another, especially when adults are out of earshot. These are just facts of childhood. But whether kids are actually allowed to use that kind of rough language in movies and television is another matter entirely. For L.A. Weekly, Jared Cowan has assembled an article on this controversial subject titled “From E.T. To Stranger Things, An Oral History Of Kids Cursing On Screen.” It’s a surprisingly weighty exploration of the topic, touching on issues of language, morality, politics, economics, tolerance, and gender. 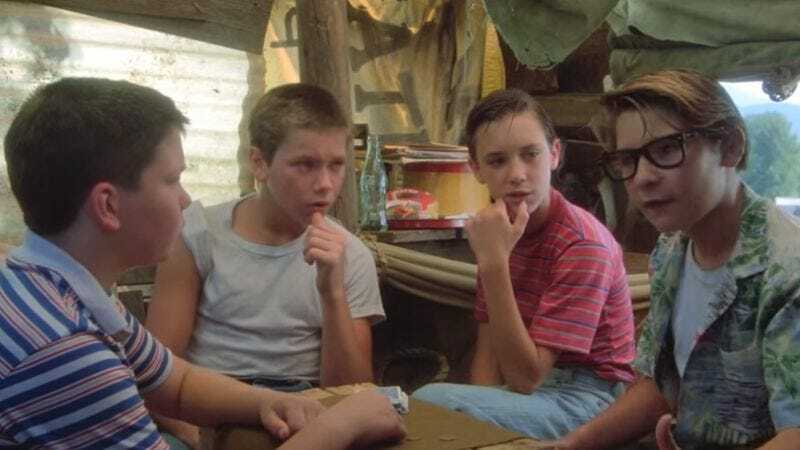 For this story, Cowan interviewed numerous actors, directors, and writers involved in the making of iconic films, including Stand By Me, The Goonies, and Adventures In Babysitting. As that list of titles may indicate, this article largely focuses on the 1980s, a golden age for pre-adolescent profanity in popular culture. Adults like to think of childhood as a sweet, innocent time when people are largely sheltered from the evils of the world. And movies mostly upheld that absurd illusion for decades, with notable exceptions like Michael Ritchie’s 1976 baseball comedy The Bad News Bears. The tide really didn’t start turning until the 1980s, when filmmakers like Steven Spielberg, Joe Dante, and Rob Reiner began to depict young characters acting and talking in a more natural, true-to-life way. Bruce Evans, co-screenwriter of Reiner’s Stand By Me, took his inspiration from the novella on which the film based. “We thought it was incredibly important to keep Stephen King’s original dialogue intact,” he says. Columbia had major reservations, but the profanity eventually stayed.